On Monday, Apple introduced new (PRODUCT)RED models of the iPhone 8 and iPhone 8 Plus, which went up for pre-order on Tuesday and are available to purchase in Apple Stores as of today. Since it's an Apple product launch day, customers interested in the new iPhone 8 color can visit Apple.com to check stock at their local Apple stores and arrange for an in-store pickup on the smartphone. 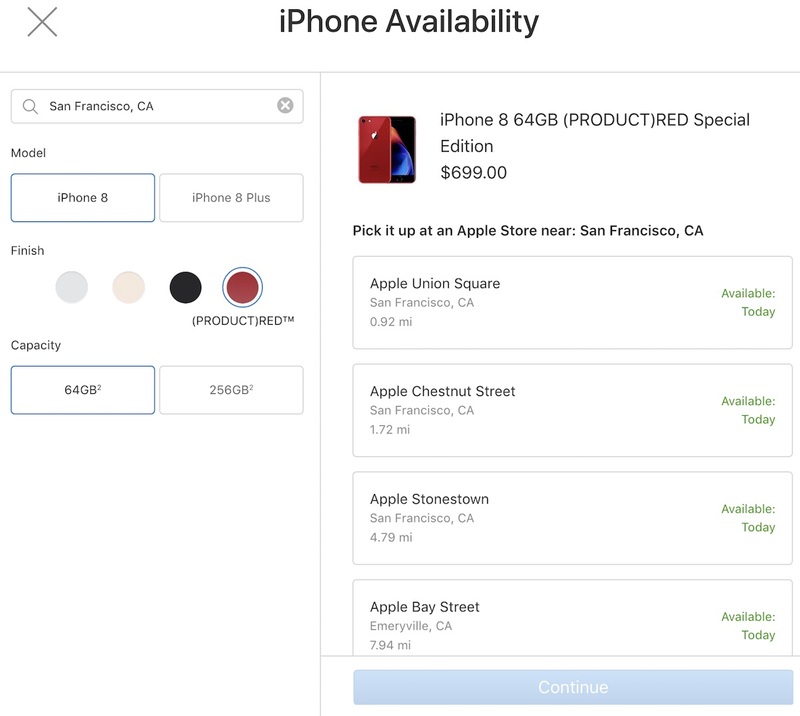 Apple's iPhone availability tool shows that the new (PRODUCT)RED iPhone 8 and iPhone 8 Plus devices should be easy to obtain today at most Apple stores across the United States and in other countries, in both 64GB and 256GB. Those who don't feel like picking up at an Apple store, or who don't live nearby one, can also choose to have the iPhone delivered via free next day shipping. The (PRODUCT)RED iPhone 8 has all of the same internals and hardware as the models that launched last September, including a glass body for wireless charging, A11 processor, True Tone display, and more. In the box, you'll get EarPods with a Lightning Connector, Lightning to USB cable, 5W USB power adapter, and a Lightning to 3.5mm headphone jack adapter. Alongside the new iPhone 8, Apple also launched a (PRODUCT)RED iPhone X Leather Folio at $99. As with every (PRODUCT)RED accessory and device, the iPhone 8 and iPhone X Leather Folio are part of Apple's partnership with (RED), which helps raise money for The Global Fund in its fight against HIV/AIDS. I truly don’t get the fascination of (PRODUCT)RED’s devices, but I am happy for those who do. * The (PRODUCT)RED iPhone 8 is over 38% more red than previous iP8s. * Its chromatic caching is up to 630nm (from a more orange 590). * The (PRODUCT)RED moniker is 265% more difficult to format correctly than even the leading Android device. This is, without a doubt, the reddest iPhone 8. Received mine this morning. The Red is deeper than I expected, it’s like a Ferrari Red like others were saying although it looked brighter in the pics I saw. Either way, this is one attractive phone! AND, very-likely the last good iPhones with Touch ID and the ALL-important Hardware Home Button. In fact, I see this as an Intelligent Test ... if Tim did it, he gets an A+ ... if Tim didn't do it, he gets an F-- ! Why no X? And why don't they offer it at launch? Cut into launch profits? Able to absorb donations because of increased margins? No doubt this is commendable, but I am talking about the product itself. Technically speaking you can donate the same amount, if not more, without the product. The world is not Black and White! I love red (certain shade of red) not all red BUT they should have released these at launch the last 2 years versus now. personally i don't get the black and white iphone..it's been beaten to death. Add more colors Apple. definitely X Plus in RED will get me. The Red is really nice. People may not jump right of way to upgrade just because of the color Red. I'll rather wait for the next iPhone x plus. Available in stores already. Apple is doomed! 1.) Proceeds are for a good cause. 2.) 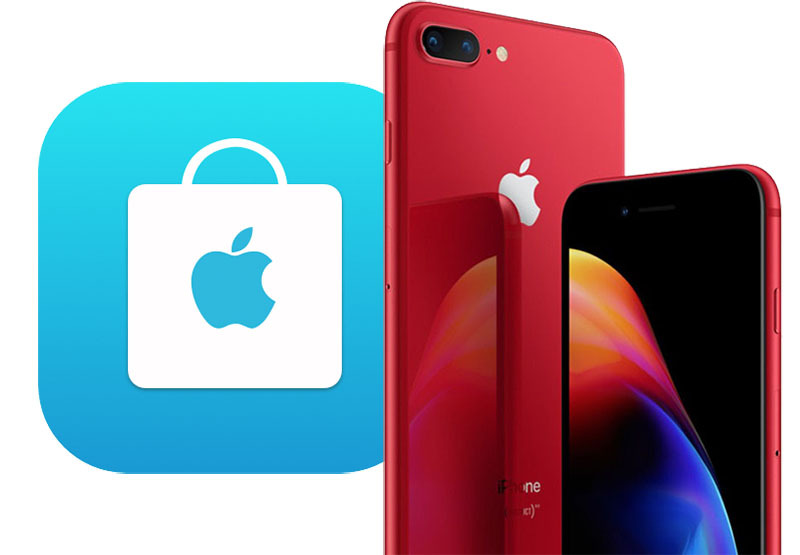 Even if somebody didn’t like the color red, it’s still an eye-catching color enough where somebody might be instigated to look at the other iPhones in the lineup that they were considering on upgrading, which means the Product Resd iPhone still serves its purpose in multiple ways. The Apple hype machine is running full bore over adding some #ff0000 powder into the anodizing vat.